Relative to other affluent countries, the United States devotes disproportionate resources to health care with disappointing results. Complex insurance rules and distorted market signals create massive inefficiencies, frustrated patients, and providers burdened by excessive paperwork. Recognizing these problems, entrepreneurs are increasingly applying information technology to health care equipment, monitoring, treatment, and service delivery, creating a sector known as digital health. These technologies, once embedded and distributed around the country, hold the potential to substantially alter the efficiency and quality of health care through the better generation, processing, and use of information; the reduction of overhead costs; and the empowerment of patients. This analysis finds that digital health venture capital investment is a substantial and growing share of total venture capital, creating, even in its infancy, valuable returns for owners. 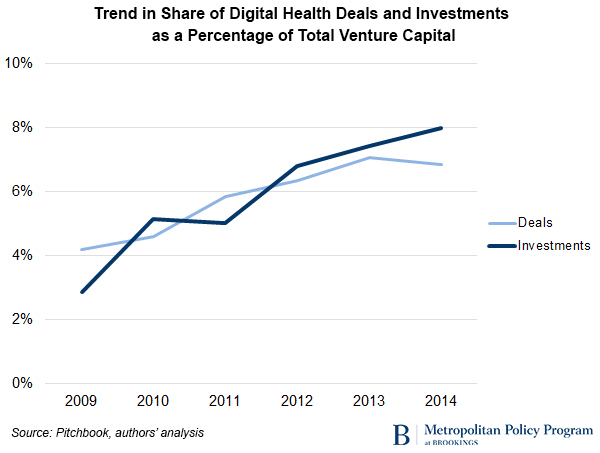 Venture investments in digital health are more dispersed geographically than total venture capital, yet digital health entrepreneurship has no geographic relationship to the traditional health care sector. 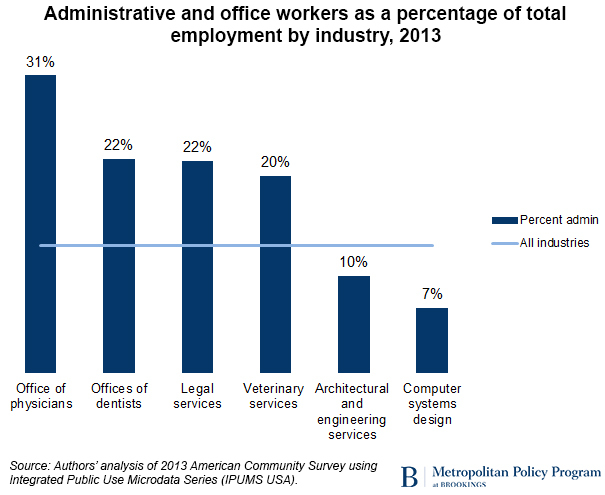 Rather, the presence of workers in advanced service industries strongly predicts digital health investment at the metropolitan scale. Companies in these industries are highly oriented toward the research and development of new products and employ high percentages of STEM workers, who have the technical skills to create and apply technological innovation. With an aging and unhealthy population, expansion of health care coverage, and a highly inefficient health care delivery system, growing demand and costs for health care seem assured. As emerging technologies converge to create the optimal conditions for digital-enabled innovation—speed and ubiquity of connectivity; fast, cheap, and more powerful computing; expansion of data collection and analytical capabilities—many sectors are taking advantage. So should health care. 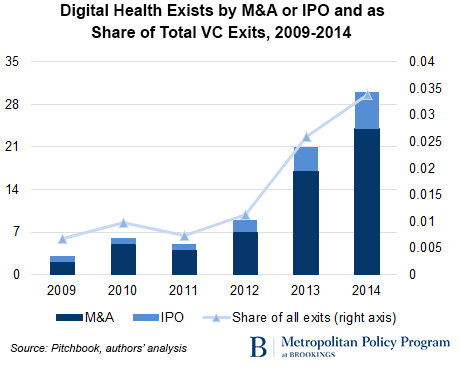 Here, we offer a partial overview of the emerging digital health sector by analyzing the universe of venture capital deals and venture-backed companies in the United States between 2009 and 2014—a period when growth in the sector accelerated. Though relatively nascent in 2009, annual digital health venture capital deals were two-and-one-half times larger in 2014 and dollars invested nearly six times greater than five years earlier—growing faster than VC as a whole. In total, $15.4 billion was invested on the back of 2,349 venture deals during the six-year period. Ultimately, the goal of venture investment is to see a return—often through acquisition or IPO. Though still relatively few in number, digital health companies have seen rapid growth in exit activity in 2013 and 2014—outpacing strong activity in the ecosystem as a whole. From 2009 to 2014, the San Francisco area took in 25 percent of total VC funding and 23 percent of digital health funding—ranking first for both. But the five largest metro areas for digital health comprised just over half of all funding (54 percent), compared with 64 percent for total VC deals. To be sure, the major VC hubs like California, Boston, and New York also generate the most digital health venture capital per worker. However, relatively high rates of digital health investment are also spread throughout the Rocky Mountain, Sun Belt, Midwest, and Southeast regions. Metro areas like San Francisco, Boston, San Jose, New York, and Los Angeles are in the top five for both total venture capital and total digital health VC. Of the top 10, Boston, Washington, Dallas, and Atlanta rank higher for digital health than for total VC; San Jose and Seattle rank (slightly) lower. 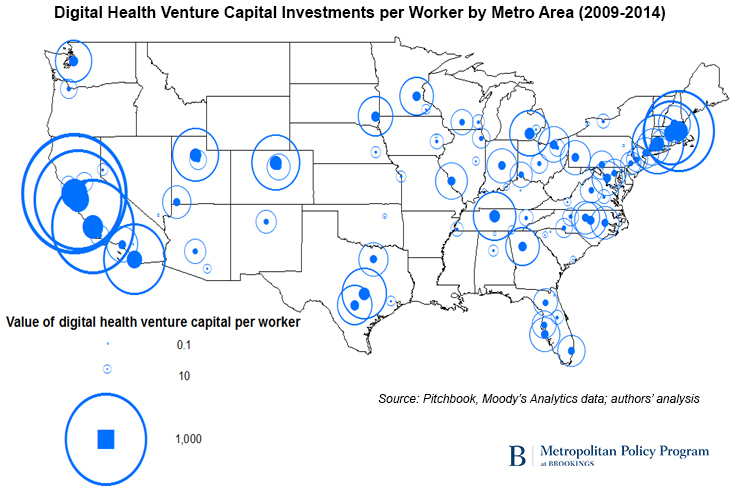 San Luis Obispo, Worcester, New Haven, and Salt Lake City are in the top 10 for digital health VC funding per metro area worker, but not for total VC per worker. Nashville is another: ranked 11th on digital health VC per worker but 52nd on total VC per worker. Austin and Boulder are the opposite. One might think that digital health entrepreneurship would be more likely to come from places with major hospitals, medical schools, or other health care providers. That does not appear to be the case. 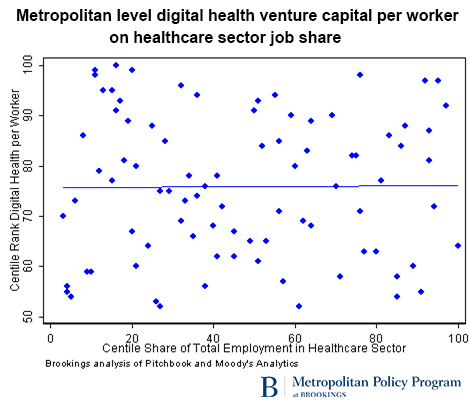 There is almost no correlation between the percentage of workers in the health care sector and the amount of venture capital per worker invested in digital health. 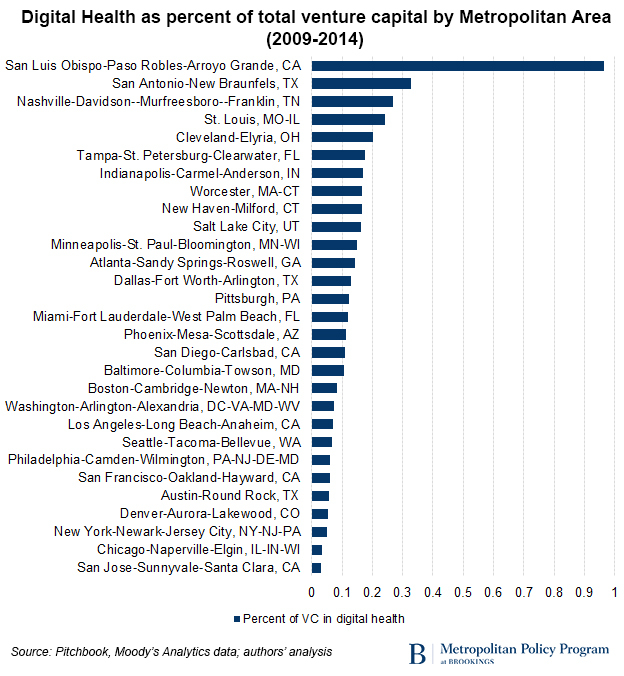 By contrast, metro areas with strong advanced service industries—like computer systems design, engineering services, and research and development services—are very likely to have high rates of digital health VC investment. The need for health care presents the United States, in particular, and all aging countries more broadly, with a massive economic challenge: how to preserve and improve health without devoting excessive resources to the health care sector. Technology is already providing an important role that will increase as a means to confront these challenges. 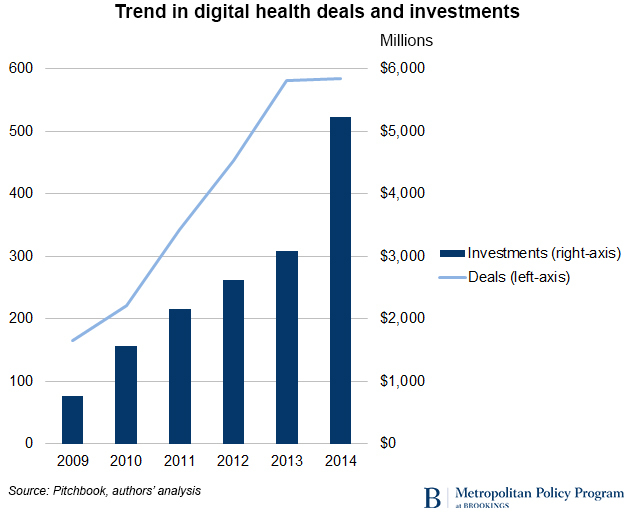 Venture capital activity in digital health has increased substantially in recent years and is absorbing a larger share of total deals and dollars invested in the United States. Digital health companies are no longer in their infancy but at already generating significant returns to both specialist investors and broader venture capital firms—signaling a sector that is moving from proof-of-concept to higher rates of expansion and implementation. Exit activity—public offerings and mergers and acquisitions—has also grown significantly in recent years. The digital health ecosystem is dispersed geographically throughout the United States, with deal and investment concentrations less concentrated in the major VC hubs than total venture capital. 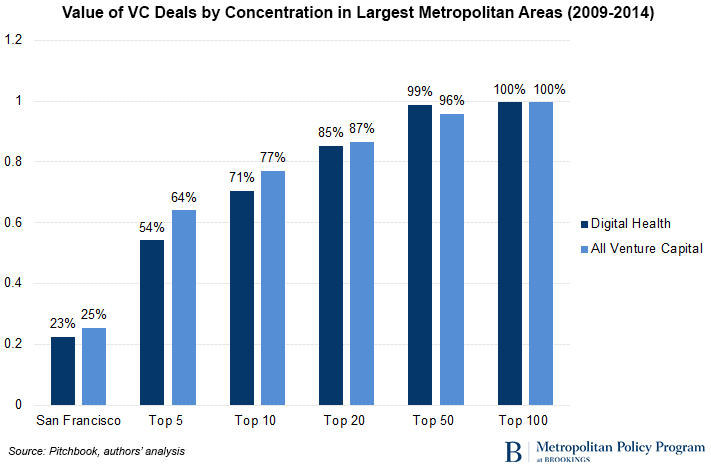 At a share of the workforce, some surprising areas emerge as important contributors to VC entrepreneurship. The geographic analysis suggests that innovation will not come from the health care sector itself but from outside it. 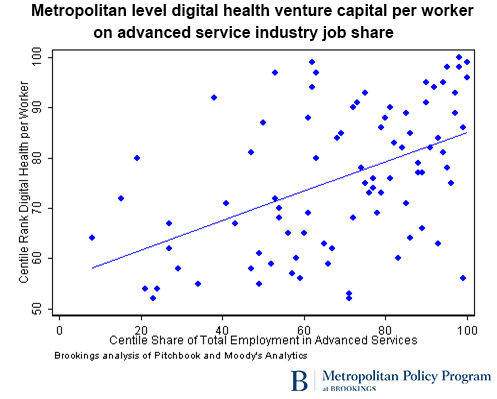 There is a strong correlation between the presence of digital health VC in a metro and a concentration of innovative “advanced industries.” Yet, areas with a high concentration of health care workers are no more likely to receive venture investment in digital health than those with low concentrations of health care workers. Only time will tell if digital health companies will fulfill their promise of increasing the quality and efficiency of health care, but there are promising signs that they will at least make a significant contribution. 2. The Congressional Budget Office projects that an additional 27 million Americans, or 6 percent of the population, will be covered under health insurance by 2020. See Congressional Budget Office, The Budget and Economic Outlook 2015 to 2025. 4. 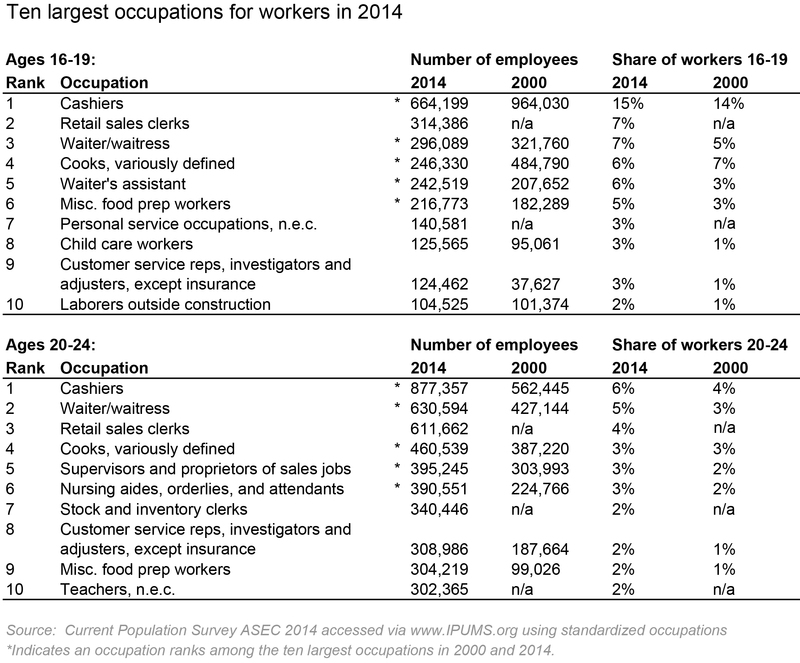 Bureau of Labor Statistics, Employment Projections 2012 to 2022. 6. Organization of Economic Co-operation and Development (2013). “Health at a Glance 2013: OECD Indicators,” Organization of Economic Co-operation and Development Publishing; Obesity Update 2014. 7. Cawley and Meyerhoefer, “The Medical Care Costs of Obesity: An Instrumental Variables Approach,” Journal of Health Economics. 9. Authors’ analysis of 2013 American Community Survey via IPUMS USA. 10. Eric Topol, The Patients Will See you Now: The Future of Medicine Is in Your Hands (Basic Books, 2015). 11. These four lists were merged together and then into the Pitchbook database, where the identity of each company was confirmed—either automatically or in many cases, manually. This was necessary because the names of early-stage companies frequently change, as does the ownership structure—businesses are regularly acquired or merged. This list was then reduced to include only companies headquartered in the United States, and those that received some venture funding between 2009 and 2014—either from venture capital firms, corporate venture investors, or other professional venture investors, such as angels or accelerators. Our analysis culminated in a list of 1,022 digital health startups.